GENEVA – The World Intellectual Property Organization (WIPO) Director General Francis Gurry, high-level members of the Swiss and Geneva governments, and the international intellectual property (IP) community inaugurated WIPO’s new Conference Hall Monday evening in a celebration that transformed the speakers’ dais into a soundstage featuring globally renowned musicians, a press release by the Organization stated. WIPO’s new 1,600 square meter Conference Hall features some 900 seats, state-of-the-art interpretation and projection facilities and pine and oak construction material sourced mainly from Switzerland. Delegates from WIPO’s 187 member states were gathered in Geneva for the annual WIPO Assemblies, taking place September 22-30, 2014. 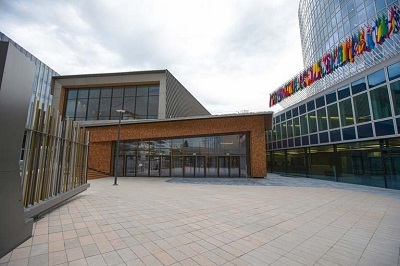 The WIPO Assemblies were being held for the first time in the new conference center, a notable new feature on Geneva’s Place des Nations that completes WIPO’s major construction plans. When the Conference Hall is not being used for WIPO meetings, it will be available for use by other parties. French electronic music composer Jean-Michel Jarre, President of the International Confederation of Societies of Authors and Composers (CISAC), helped open the new center with a call to help creators. "Creators around the world depend on rights and policies that protect their interests and guarantee a fair remuneration for them,” he said. “WIPO is where such rights and policies are discussed and agreed internationally. As President of CISAC, I call upon all WIPO member states to recognize the importance of creativity, not only to our culture, but also as a driver of global economic development. Now is the time to develop new and fruitful partnerships between creators, WIPO and its member states, leading to initiatives that would ensure a sustainable future for creators." After opening speeches, delegates and other guests enjoyed musical performances by Peru’s Suzanne Baca and Senegal’s Ismael Lô, whose bands turned the space intended for diplomatic proceedings into a concert hall reverberating with rhythms from around the world. The new Conference Hall gives priority to sustainability, using local wood, natural light, hybrid ventilation combining natural and mechanical means, and a cooling system drawing water from Lake Léman. Around and below the Conference Hall, new facilities include a press room, a telecommunication room and all the facilities to service meetings in the new hall. In addition, the project included the renovation of several areas of the main headquarters building, in particular the creation of five additional meeting rooms for group and bilateral meetings, as well as an expanded lobby which is now more accommodating for exhibitions and showcases of artists, as well as other IP-related activities sponsored by WIPO member states. Construction began in August 2011. WIPO is the global forum for the promotion of IP policy, services, information and cooperation. A specialized agency of the United Nations, WIPO assists its 187 member states in developing a balanced international IP legal framework to meet society’s evolving needs. It provides business services for obtaining IP rights in multiple countries and resolving disputes. It delivers capacity-building programs to help developing countries benefit from using IP. And it provides free access to unique knowledge banks of IP information.